By Melanie Balestra, NP, Esq. On May 8, 2018, the California Supreme Court ruled that a three-factor test called the “ABC test” must be applied to determine if an independent contractor is actually an employee subject to the California Wage Orders. What does this mean? The NP must meet ALL OF the above criteria. If the NP is working for a facility or office that provides medical services, the NP cannot work as an independent contractor. The number of hours is no longer valid. Even if the NP works four hours, s/he must be an employee. If the NP is an employer, s/he cannot hire other providers as independent contractors. The providers must all be employees. If the state determines the NP is an employee, the employer will be fined $10,000 per independent contractor for the first violation. There are definitely pros and cons to this decision. It allows most NPs to get state and federal benefits and be regulated by labor laws. However, many NPs who work part time jobs and file 1099s will no longer be able to receive their entire income but will have required deductions taken from their paycheck and be a W2 employee. It may also affect small business owners who cannot afford to pay state and federal required benefits. Melanie Balestra is both an attorney and a nurse practitioner. 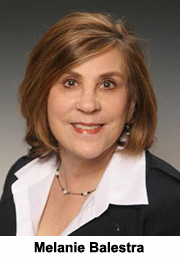 She is a former President of CANP, and is currently President of the American Association of Nurse Attorneys, which in 2016 honored her with the award for Outstanding Health Law & Compliance Section Member. She has law offices in Irvine and Newport Beach, and continues to work part time as a PNP and Director of Pediatrics at the Laguna Beach Community Clinic.